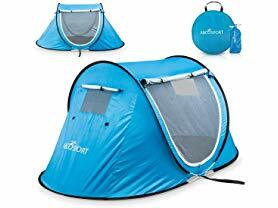 Today ONLY (2/9), Abco Sport Pop-Up Cabana Beach Tent is $29.99 (Retail $59.99). Sleep under the stars, feel the surroundings, yet have the desired privacy – our auto setup tent is a blessing for casual campers or travelers who like to have some relaxing outdoor time! Effortless Camping: Pops open into a ready-to-use form (auto-setup) in a blink of an eye &amp; proves easy to fold back into a compact form – Abco Sport-Up Pop up tent is ideal for casual camping and accommodates 1-2 persons. Like a beautiful spot enroute? Setup your tent instantly! Double Doors: With double doors on both left and right side, it's easy to step out from either side. Moreover, a combination of inner zippered screen plus outer zippered nylon layer gives the ability to easily switch between high breathability and complete privacy. High Breathability: Two mesh windows on the front and back add further to the air circulation while the solid nylon flaps over the windows allow for privacy. Not only breathability, you can just open everything and enjoy the surroundings too. Carrying Bag &amp; Accessories: Comes with a carry bag that's ideal for storage and carrying it along, and in addition, a small bag for accessories to keep them organized – occupies little space in your car trunk or even when stored at home.